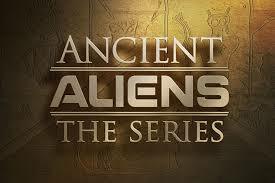 The Ancient Aliens Series – produced by the History Channel – ran from 2010 – 2014, and consists of 6 Seasons of 82 episodes, which last over 68 hours. In the Region 1 DVD Box-set of this series (2014), there is included 12 extra-episodes not aired on TV during its original run. The format is a continuous presentation of a counter-narrative to conventional academia and established religion. All science is incorrect because it does not recognise that all the knowledge that human-kind has developed over its existence is a product of ancient (alien) astronauts who have visited the planet Earth and imparted their advanced knowledge to its backward inhabitants. Established religions are wrong because their adherents do not recognise that the ‘deities’ they worship are not gods as such, but were in fact ancient (alien) astronauts that visited the Earth and imparted their advanced knowledge to its backward inhabitants. Astute readers will see a pattern forming. What is interesting about this exercise of ‘free thought’ is that it is thoroughly bourgeois in nature (and therefore a product of the industrial and post-industrial era), that is in reality a re-representation of Judeo-Christian theology through the rubric of a pseudo-science. The ancient astronaut theory is one that is religious in nature – but freed from the restrictive yoke of conventional religion – and scientific in the limited sense that it does not adhere to the established scientific method that states that nothing is happening unless it is otherwise proven to be happening. The ancient astronaut theory assumes unscientifically that its premise has already been proven (in this regard it is like a faith-based religion), and all that its adherents have to do is simply fill-in the evidential gap by gathering together disparate facts that have no causal connection, in an attempt to build a scientific-like case for its assumptions and conclusions. As a counter-narrative, it does not view itself as ‘illogical’ but rather assigns to itself the idea that it is a higher science simply because it appears to reject conventional religion. However, this is a false assumption because the ancient astronaut theory is essentially a religious belief system based upon the worship of disparate facts, and it is this worship of disparate facts (gathered from all areas of different scientific and philosophical academic subjects) that replaces the focal point of a ‘god’, and gives it its assumed ‘scientific’ bent. In a very real sense, the ancient astronaut theory is the secularisation of the belief in theistic religion – it is a religion that does not need a god-construct to be religious – but it does retain and depend upon the use of ‘faith’ to hold its theoretical assumptions together. Without ‘faith’ the ancient astronaut theory falls to pieces – because that is all it is – a collection of misconstrued disparate facts that are used to support conclusions that do not exist. In other words, there is no scientific proof for the assumptions and conclusions contained within the vague subject area that is the ancient astronaut theory. This is not an efficient manner to explore the subject of the paranormal – if such a subject exists at all. One of the seductive aspects of the ancient astronaut theory is that it does operate from a limitless theoretical base that pulls together often very interesting historical and philosophical facts and figures. In fact this ability to continuously pick-out significant or unusual events is a foundational and definitional aspect of this theory. Its premise is the ever-expanding collection of data that is assumed to prove its central hypothesis, but of course as the central hypothesis is never actually proven, all the adherents of the theory can do is continuously ‘gather’ more facts. This behaviour is very similar to that of the religious fanatic who desperately wants to believe in a theistic entity, but deep-down knows that it is not true. All such a religionist can do is try to gather support for his or her faith by getting more people to believe in it as well. This behaviour never ‘proves’ that god exists, however, but through its continuous search for converts, this fact becomes ‘hidden’ and ‘obscured’. For believers in theistic religions, scientific proof is not required to substantiate their beliefs, as this type of human organisation is premised upon numbers of adherents and not on scientific facts. This is the manifest stupidity of religious thought. Fact is ignored for the propagation of popularity, and through this popularity, large segments of the population are kept physically controlled and in a state of psychological and intellectual arrested development. The difference between conventional religion and the ancient astronaut theory is that the latter, whilst behaving exactly like the former, actually believes that it is being ‘scientific’ in its modern pursuit of a faith-based belief system. If this analysis was not enough to blow its theoretical premise out of the speculative water, its obvious Eurocentric and middle class bias should finally lay it to rest. Not only does this series present a thoroughly ‘white’ view of history, but it uses the distinctly modern ‘American’ view of the world to convey a mishmash of academic and religious facts and fictions in an obviously ‘capitalist’ and ‘liberal’ format. This bourgeois (middle class) view of the world, its history, origins and evolution, gives the absurd impression that human socio-economic manifestation has always been modern ‘capitalist’, when in fact human history in its entirety has for most of that time, not in any way operated through a modern capitalist system. This is perhaps the greatest flaw in the ancient astronaut theory which purports to present a revelation of insight that proves that the greatest thinking of the modern world is incorrect and out of date. Far from being revolutionary or revelatory, the ancient astronaut theory is nothing other than post-WWII US pro-capitalist propaganda that was designed in its origination to confront and discredit the Soviet Union and its Communist ideology. This bourgeois thinking presents aliens or extra-terrestrials as conforming to contemporary US pro-capitalist propaganda that is essentially Eurocentric in its design. This effect is similar to how old sci-fi films when viewed today, always seems ludicrous in their theoretical imagining and presentation of the ‘future’, because the ‘future’ they imagine, no matter how apparently bizarre it may seem at the time of its creation, is always obviously deeply rooted in the socio-economic circumstances of its time period. The illegal invasion of Iraq by US military forces in 2003 is supported by the makers of the Ancient Astronaut Series. This is part of the general trend found within the series of the application of a racist narrative that interprets historical events from a Eurocentric, imperialist perspective. The US forces not only destroyed the sovereign government of Iraq (which led to the eventual execution by hanging of its last President Saddam Hussein), but it also destroyed Iraqi society completely so that chaos reigned in the place of law and order. The US’s policy encouraged previously outlawed extremist religious factions in Iraq to rise-up and commit mass murder and destruction of property. The series contains an episode that refers to this cultural annihilation of ancient civilisation as ‘Operation Freedom’, and buys in entirely to the lie that the US military is ‘freeing’ the Iraqi population by destroying its culture and political system. The story evolved around the fact that the US allowed museums in Iraq to be ransacked by looters and thieves, but it did not present it that way. Instead the Ancient Astronaut Series actually blamed the Iraqi people themselves for looting its own historical artefacts – but it did not attempt to explain why a people the US military had subjugated would be motivated to ‘steal’ artefacts that they already owned. This is a peculiar omission of insight for a theory that trades on the assumed possession of a ‘superior’ knowledge – a superior knowledge that apparently cannot see through capitalism and the imperialism it inspires. Throughout the series is the racist misrepresentation of Tibet and China. The view of Tibet the series presents is that of the mythological creation in the West invented by such people as Lobsang Rampa and by others in the Theosophy movement. This is a false ahistorical viewpoint that tells the viewer absolutely nothing about ‘real’ Tibet. The programmes also perpetuate the modern myth that Tibet was invaded by China in 1959, and that Tibet was never part of China. This is very bad academia. In 1949 (when the Communists came to power) Tibet was part of China. In 1911 (when the pro-Western Nationalists came to power) Tibet was part of China. In 1644 (when the Qing Dynasty came to power), Tibet was part of China. Even before this, parts of west and south-western China were annexed and controlled by Tibet, so from a correct historical perspective, China did not ‘invade’ Tibet in 1959 because Tibet was already a part of China. Again, what is being seen here is US Cold War propaganda designed to destroy Communist China, and turn Western opinion against it. Furthermore, this series suggests that what are in fact Han Dynasty tombs in north and northwest China are really Egyptian-type pyramids and that the Chinese is preventing its own people and the people of the world from knowing about them. Any search through ‘Baidu’ the Chinese search-engine will demonstrate that these Han Dynasty tombs are well known, well researched, well recorded and well explored, not only by the Chinese people, but also by many foreign tourists over the years. This is yet another example of how the ancient astronaut theory that purports to see more than most ordinary people, cannot even see through the superficial and quite stupid disinformation created by the USA. For those who want to understand the reality of the US in its attempt to destabilise Communist China through Tibet, please access the subject by typing ‘CIA in Tibet’ through any search engine. In the later episodes, the USA itself is presented as a ‘special’ god-protected country that has a predestined mission on Earth. Of course, this is merely a reworking of the Judeo-Christian myth whereby America is viewed as another Israel, and Americans simply as more Israelites. America is the chosen country on Earth and all of its history is interpreted as being comprised of events caused by extra-terrestrials who want to protect and guide the development of its culture. This gives the gloss that any act of vicious US imperialism in the world is automatically elevated above its actual motivation of greed, and into the category of divine revelation. The supposedly superior culture of the extra-terrestrials is obviously the Judeo-Christian god-concept and explains why it exists up above where heaven is supposed to be. When individual aliens visit the Earth and bestow their blessings upon humanity, this is nothing other than the reworking of the Jesus mythos. An alien visiting Earth is the ‘son’ or ‘representative’ of the superior extra-terrestrial culture (or ‘god’) from which he or she has arisen. This childish philosophy reduces humanity to an inert biological entity that can do nothing for itself, and must patiently ‘wait’ for superior beings to guide it along. Jesus – like the aliens – visited the Earth a very long time ago, and just as Christian theology talks of Jesus one day returning and creating heaven on Earth, so the ancient astronaut theorists talk of aliens returning to Earth to transform it forever. This is the sullying of hard and progressive science with that of an imagination of a non-existing reality that is raised to the level of assumed facts. This may well be an exercise in free thought, but it is a free thought that destroys all human progression throughout history, and reduces humanity into an infantile state of being. The point is that there may well exist other beings in the universe – multiverse, and it may be equally true that some of these beings have very advanced cultures. It could also be true that they have either visited, or may yet visit the Earth, but none of this can be ‘scientifically’ known if human consciousness is allowed to regress into a religious mind-set that mimics science (whilst fundamentally rejecting its methodological premise). Humanity has made itself and does not have to rely upon imagined gods or theoretical aliens to justify its existence. One day humanity will in all likelihood encounter extra-terrestrials, but this will be through a matter of logical science and not religious mythology. The interference in humanity’s natural evolution through alien manipulation is simply yet another reworking of the Judeo-Christian myth of god performing ‘miracles’ in the world. A theological ‘miracle’ is defined as the momentary suspension of the operation of the laws of nature. This definition is exactly the theoretical ground that the ancient astronaut theory both occupies and operates from. This is why it cannot be viewed as a legitimate science. It is a religion masquerading as a science, and this is a fact even if it is one day ‘scientifically’ proven that a) aliens exist, and b) they once visited the Earth in the distant past. This analysis holds even if it is also scientifically proven that alien technology was once used to alter human DNA – which at the moment is simply an interesting speculation. Speculating about reality is the origin of all scientific breakthroughs, but when a pre-existing theological construct is assumed to exist without evidence, a true scientific endeavour cannot be developed. This is really a debate about how the human mind can be used. The point is that the ancient astronaut theory is obviously a Eurocentric, religiously inspired, revelatory, miracle performing myth that is waiting to be proven correct – like any good religion. It just so happens that along the way, this modern myth has co-opted various aspects of modern science, whilst rejecting the conclusions of that science. It is all good fun just as long as readers can see beyond the old conditioning presented in a new and highly seductive light. It is the brain of humanity that will travel to the stars, and it will do this through intellectual observation and technological developmental. To reach the stars humanity should abandon the dead-weight of the past and fully embrace the future, or it will not be able to break free of Earth’s gravity!